Whether you work within the construction industry or not, it is highly unlike that you will not have heard of John Deere. They are world renowned for their ability to design and manufacture heavy-duty equipment for use in almost any scenario. From garden tractors to industrial sized excavators, John Deere are leaders in their field and known for their quality of design. The pallet forks that they offer come in two general ranges, standard and heavy-duty types. There are some similarities between the two as they both offer steps on the sides of the frame of the fork, which allows the fork easy entry into fixings of the digger itself. This means that usually, assistance from a fellow worker will not be required when swapping from one attachment to the new pallet fork attachments. Standard pallet forks are known as rails, and their base holds them always in a single rigid position. This will only tip as and when the vehicle operator chooses to tilt the entire attachment as one. The rail style design was chosen for its rigid abilities and each rail is attached to a one-piece backrest to save weight. This is important as they are generally used as attachments on the smaller vehicles in their ranges. There are various sizes and widths, which you can choose the pallet fork attachments in, ranging from 8 to 40 inches apart in 4 inch increments, so this offers 8 different potential positions for varying requirements. 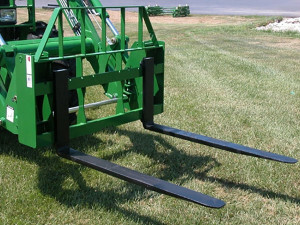 The heavier duty pallet forks are designs very similarly, but have a much broader frame. The forks themselves are much thicker, thus allowing them to handle loads of up to 5000 pounds in weight at a time. 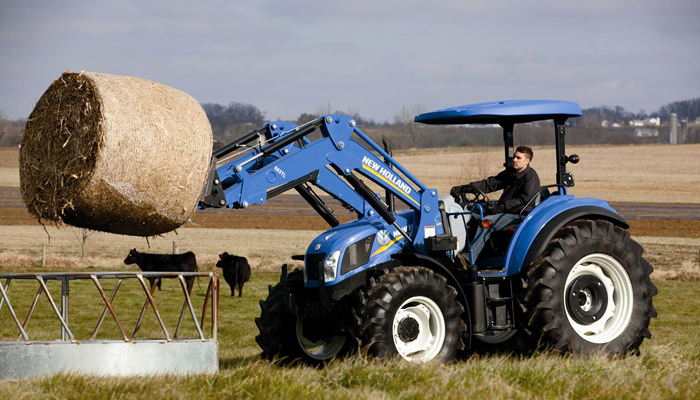 Alongside the pallet fork attachments, many others are available to fit the same models of tractors and diggers. 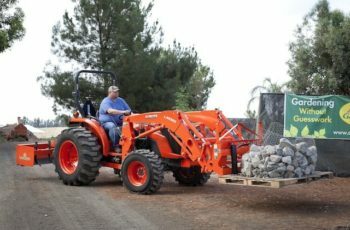 There are the obvious attachments such as digger buckets and scoops, but so much more can be done with a single piece of equipment. For example, should you wish to break up old tarmac or path work, you can attach a breaker or a hammer spike, as they are sometimes known, to punch holes into the hard ground. There are various depth and width buckets you can use for scooping up soil and transporting it into a skip, snowplows for removing sand and low lying ice from the floor, brooms for sweeping up building site mess very quickly and everything from balers to backhoes and cold planers. Some of the broom attachments even have a pick-up ability, so rather than simply move all dust and dirt to one side, they will pick up the mess for removal later on. The height control of the brushes can also be adjusted so can be used on the ground or higher up on steps or even second floors should the reach of your vehicle be long enough.